Normalization incorporates weather sensitivity and calculated heating & cooling degree days to provide a year-over-year, “apples-to-apples” comparison of utility consumption. 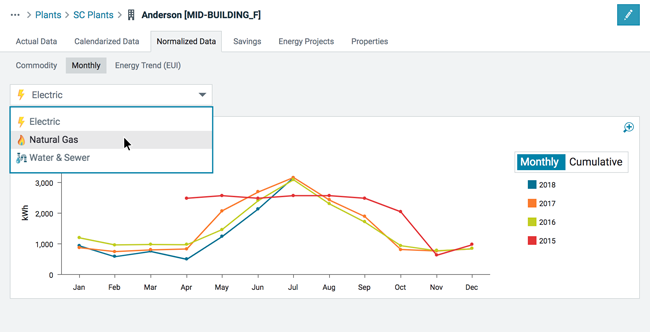 The weather normalization process begins with calendarized usage data, wherein energy use is divided into daily “buckets” and allocated to the appropriate calendar month. Next, daily consumption values for weather-sensitive meters are adjusted to reflect degree days in the user-selected base year. The process eliminates weather as a factor in energy consumption to present a fair month-to-month comparison. The result is an easy-to-understand, weather-normalized energy use chart that can be very useful for evaluating the impact of energy conservation efforts.